The best things begin with, "I've always wanted to..."
Adult Learn to Row Registration Open! attendance to all five classes in the session is important. Experience the fun of rowing on the beautiful Mississippi! This 3-hour class is designed to give you a feel for rowing team boats. Tour the boathouse, learn the rowing stroke, then head out on the water in our safe and stable rowing “barge.” Our stretch of the Mississippi is home to bald eagles, falcons, beavers, and foxes, so when you aren’t rowing, there’s plenty to see! 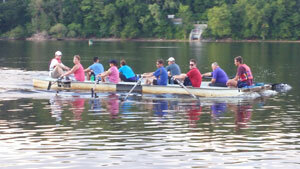 Class size of 10 rowers (minimum of 8), Cost: $75/person.